Missing: Clint Barton. Last seen in *checks Google* Captain America: Civil War. Yep, Hawkeye hasn’t been around for what feels like an age (in MCU terms, anyway). But he’s back in Avengers: Infinity War… right? 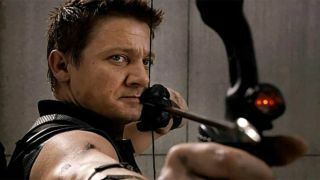 In an interview with the directors of the third Avengers movie, our sister publication Total Film magazine got to the bottom of the issue as to why Jeremy Renner has been MIA in each of the trailers – and it sounds ominous. Subscribe: You can sign up for future issues of Total Film for more exclusive news and features on Fantastic Beasts 2, Solo: A Star Wars Story, and even more. Subscribe now! “All will be explained when people see the movie,” says Anthony Russo, when asked about Hawkeye’s continued absence, in a quote that feels me with dread. “It’s all tied into the story.” Seriously? That’s not helping. Hawkeye is in Avengers: Infinity War though and, as Total Film’s set visit confirms, he’s rocking a snazzy new look, complete with mohawk. Don’t worry, though, his is not the only part that’s been left on the cutting room floor. “We were considering showing [Thanos’] backstory,” says Anthony Russo, “but ultimately felt it wasn’t necessary for the movie.” While fans of the Mad Titan may be feeling a little sore than we don’t get to see the method behind the madness, we’re still getting an Infinity War “told from his point of view,” which is surely better than any shoehorned origin tale. Hawkeye not being in trailers for massive spoiler-y reasons? No Thanos backstory but we’re getting something bigger and better than that? Colour me intrigued. And purple. With a mohawk. For the rest of the humongous cover feature on Avengers: Infinity War, you’ll have to pick up the new issue of Total Film when it hits shelves on April 6. You can also subscribe here.